Luas Tram Crashes Into Bus - O'Connell Street Dublin, originally uploaded by infomatique. 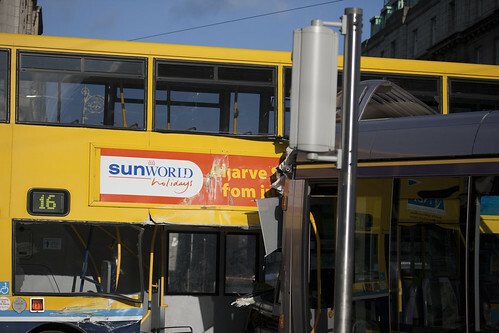 [UPDATED 24 April 2012]: Luas driver has pleaded not guilty to a charge arising from a 2009 crash between a Luas tram and a bus on O'Connell Street in Dublin. 39-year-old Oriyomi Emmanuel of Jamestown Park, Ratoath, County Meath, denies a charge which alleges the dangerous working of a railway under the Railway Safety Act in September 2009. A jury has been sworn in and his trial is due to get underway at the Circuit Criminal Court shortly. 21 people injured (3 seriously) when a tram crashes into a number 16 bus just outside Easons on O'Connell Street.